Paul Dano Photos, News, and Videos | Just Jared Jr.
Devon Bostick is Unrecognizable on 'Okja' Set! Devon Bostick rocks an interesting pink ensemble while on set of his new film Okja on Saturday (August 13) in Vancouver, Canada. 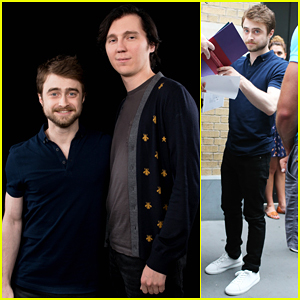 The 24-year-old 100 star was joined by his co-star Paul Dano, who walked around in between scenes with girlfriend Zoe Kazan. Okja follows a young girl named Mija who risks everything to prevent a powerful, multi-national company from kidnapping her best friend – a massive animal named Okja. “#The100 S4 begins filming today. If you haven’t seen yet, the show’s backdrop is Post-Trumpocalypse,” Devon tweeted earlier in the month. Daniel Radcliffe is greeted by a flock of fans outside the Apple Store Soho before making his way inside with co-star Paul Dano to promote their flick Swiss Army Man on Monday (July 27) in New York City. That same day, the 26-year-old actor and Paul, 32, then made their way to the AOL Headquarters to attend their AOL Build panel for the film. Daniel recently revealed that he would not rule out a return to Harry Potter if the script was right. 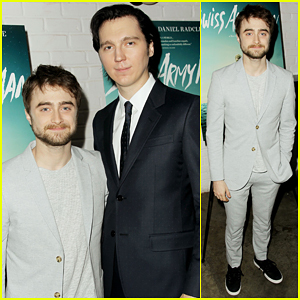 Daniel Radcliffe Brings 'Swiss Army Man' To NYC! Daniel Radcliffe suits up in grey to attend the premiere of his latest film Swiss Army Man held at the Metrograph on Tuesday (June 21) in New York City. The 26-year-old actor was joined at the event by his co-star Paul Dano and girlfriend Zoe Kazan, directors Daniel Kwan and Daniel Scheinert, as well as Arturo Castro, Britne Oldford, Billy Magnussen and Alex Karpovsky. The evening before, Daniel made an appearance on Late Night with Seth Meyers and revealed the advice Donald Trump gave him when he was 11. Olivia Cooke really sparkles on the blue carpet as she arrives at the 2016 Film Independent Spirit Awards on Saturday afternoon (February 27) in Santa Monica, Calif. The 22-year-old actress kept close to boyfriend Christopher Abbott, who is nominated at the annual award show. Couple Paul Dano and Zoe Kazan were also spotted at the event together. In case you missed it, Olivia just got a new co-star for Ready Player One — Tye Sheridan! See the news on JJJ! Saoirse Ronan steps out with Lily James for W Magazine‘s celebration of the ‘Best Performances’ Portfolio and the 2016 Golden Globes held at Chateau Marmont on Thursday night (January 7) in Los Angeles. The 21- and 26-year-old actresses met up with some of Lily‘s co-stars Suki Waterhouse (from Pride and Prejudice and Zombies) and Paul Dano (from War and Peace) with his girlfriend, actress Zoe Kazan and Lola Kirke. After celebrating her’s and other stars’ covers for the mag’s Best Performances issue, Saoirse received a BAFTA nomination for Best Actress for her role in Brooklyn! FYI: Lily is wearing an Alexander McQueen dress with Jennifer Meyer jewelry. Suki wore a Brock Collection dress with a Cambridge satchel.